Thermal oxidation through incinerator is one of the proven technologies for destruction of hazardous waste in all the forms i.e. solid / semi solid / liquid and gaseous, based on the feeding system, so as to render them innocuous in the form of non-toxic and non-hazardous residues. Though it is a solution for destruction of complex hazardous waste, requires knowledge to judge the compatibility of various wastes for the purpose of homogenization of feeding waste, to operate and maintain thermal processes, pollution control devices, which demands skill & experience, in order to comply with the environmental regulations for common hazardous waste incineration facilities ( ANNEXURE - I ). 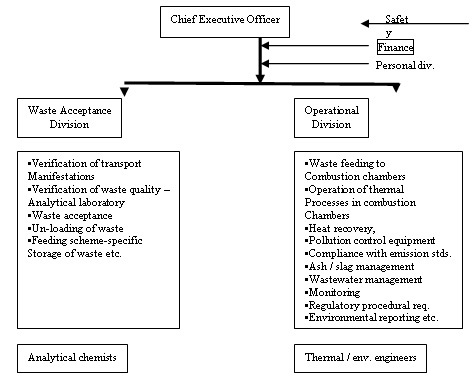 The Common incineration facilities are, in principle, expected to handle the hazardous waste in solid and liquid forms having high degree of variation in respect of characteristics due to different nature of member industries, which will have direct bearing on efficiency of combustion system and pollution control devices. Therefore, experience in other parts of the world, particularly in case of handling hazardous waste in solid form, drive us to adopt rotary kilns followed by secondary combustion chambers as a set-up for combustion part of the incineration system, unless other combinations demonstrate equally in delivering required efficiency. As such, in India, existing three common incineration facilities do have the same combination; therefore the guidelines presented in this document cover such set-up. Common hazardous waste incineration facilities are those facilities, which handle hazardous waste from more than one industry either installed as an integral part or located elsewhere. Various concerned components of common incineration facility include proper transportation, storage, analytical laboratory facilities, feeding mechanism, incineration system (rotary kiln & post combustion chamber), gas cleaning system, tail gas monitoring facilities with automatic on-line monitoring & control facilities, ash/slag management, bleed/scrubber liquor management and measures for health protection of workers. Guidelines for maintaining each of these components in order to comply with the prescribed standards are given in the subsequent chapters. Generator of the hazardous waste shall ensure that wastes are packaged in a manner suitable for safe handling, storage and transportation. Labeling on packaging is readily visible and material used for packaging shall withstand physical and climatic conditions. Generator shall ensure that information regarding characteristics of wastes particularly in terms of being Corrosive, Reactive, Ignitable or Toxic is provided on the label. All hazardous waste containers shall be provided with a general label as given in Form 8 in Hazardous Waste (Management & Handling) Rules, 1989, as amended. Copy 5 (Green) Forward to Pollution Control Board by the operator of facility after disposal. Copy 6 (Blue) Returned to the occupier by the operator of the facility after disposal. Generator shall provide the transporter with relevant information in Form 10 i.e. Transport Emergency (TREM) Card regarding the hazardous nature of the waste and measures to be taken in case of an emergency. Obtaining permission from SPCB for transport of hazardous waste [in addition to any other permissions that may be required under the Motor Vehicles (Amendment) Act of 1988]. The transport vehicles shall be designed suitably to handle and transport the hazardous wastes of various characteristics. Maintaining the manifest system as required. Cleanup in case of contamination. Separate area should be earmarked for storing the waste and storage area may consist of different cells for storing different kinds of hazardous wastes. Ignitable, reactive and non-compatible wastes shall be stored separately. No open storage is permissible and the designated hazardous waste storage area shall have proper enclosures, including safety requirements. In order to have appropriate measures to prevent percolation of spills, leaks etc. to the soil and ground water, the storage area may be provided with concrete pavement and / or welded iron sheet depending on the characteristics of the waste handled. Storage area shall be designed in such a way that the floor level is at least 150 mm above the maximum flood level. Proper stacking of drums with wooden frames shall be practised. Incase of spills / leaks, cotton shall be used for cleaning instead of water. Signboards showing precautionary measures to be taken, in case of normal and emergency situations shall be displayed at appropriate locations. A system for inspection of storage area to check the conditions of the containers, spillages, leakages etc. shall be established and proper records shall be maintained. Generators sending hazardous waste to the incineration facility are required to provide necessary test report of hazardous waste to the operator along with the information on the process(s) of its generation. Storage & feeding requirements: Physical form of waste, pH, hazardous waste properties such as inflammability, reactivity, compatibility with other wastes etc. for segregating the waste and to store accordingly, in order to suit feeding mechanism. Operating conditions of the furnaces: viscosity, moisture content, total organic carbon, calorific value, volatility of the waste, special incompatible wastes, inorganic salts, metals etc. Air pollution control devices : chlorides & other halogens, sulphur, nitrates, mercury & other heavy metals etc. Therefore, relevant parameters may be analyzed while accepting the waste. The laboratory facilities shall give clear directions to the operators, two days in advance as far as possible, regarding type of waste to be incinerated in a particular date and its properties. Therefore, the laboratory at the incineration facilities shall be capable of monitoring all the above parameters. Maintaining designed heat capacity of the combustion chambers under varying feed calorific values demands skill. In absence of proper hands on training and adequate knowledge, the minimum negative pressure could not be maintained at all the times leading to diffused emissions / sudden puffing of emissions into the secondary combustion chambers constraining the retention time resulting in poor efficiency. Besides, these temperature fluctuations will have negative bearing on refractory and insulation material. Therefore, continuous feeding of homogeneous waste having same / similar calorific value to the combustion chambers is the desired choice. However, often maintaining homogeneous feed of waste is not feasible due to incompatibility of different wastes for mixing. Conventionally, hazardous wastes in solid form are fed through a hydraulic system, which will have automatic two gates i.e. once the outside plate is closed, inner side plate is opened and solid waste mass is hydraulically pushed inside the Kiln and once the inner side plate is closed, outer plate is opened for next batch of solid waste. This system, besides negative pressure in the combustion chambers is required to ensure safety and to prevent workmen exposure to thermal radiation. Reactive waste, which can not be mixed with others Sealed drums, as such, may be charged into the kilns. Depending on calorific value, size of the drum / container may be specified to the member industry for such waste. Other mixable solid waste having moderate calorific value May be homogenized to the extent possible and charged to the kilns at desired quantity of packets and frequency. Specific materials which melts on heating Here, the possibility would be to ask the member industry to store in required capacity of the container, which can be directly injected with out heating; or to provide a system by which such drums can be heated-up and can be charged through closed-loop pressurized nitrogen. Relatively low conc. of solids / low viscosity Pumps similar to the one used for cement concrete charging may be used. Highly reactive / inflammable liquids May be directly injected into combustion chambers without mixing with other wastes. The charging from the containers may be through closed loop nitrogen pressure purging. Liquids having high calorific value (ex. contaminated solvents) Can replace auxiliary fuel requirement, once the combustion chambers reaches to its designed temperatures. Liquids having properties similar to that of auxiliary fuel Once it is established, these liquids can be used for raising the initial temperature of the combustion chambers. However, specific tests in support of such claims be produced by a recognized credible third party. Liquids having low calorific values These may be injected in to kilns to suppress the temperature shoot-ups due to high calorific solid/ other special liquid waste feeds. 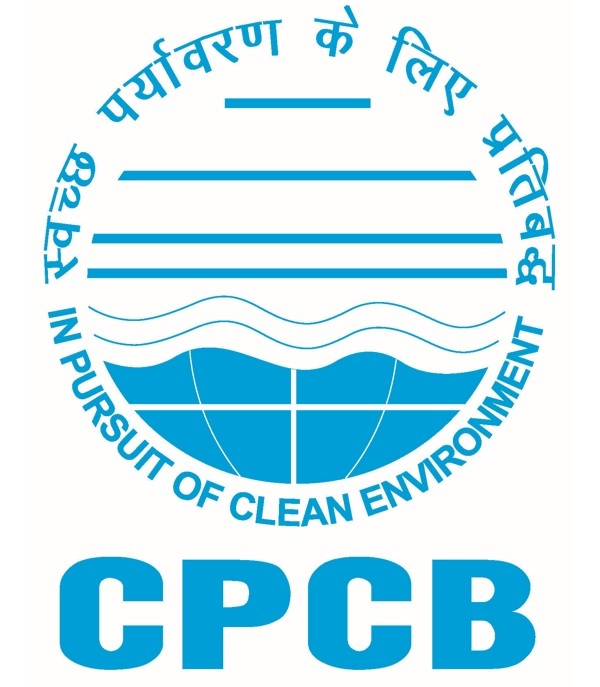 Depending on type of wastes received, the scheme shall be established by the common incineration facility and the member industry shall place the corresponding code number/ sticker and it is to be verified by analytical laboratory of common incineration facility to ensure appropriate feeding by operator of the facility. While charging the liquid hazardous waste, filtering the liquids may be required to avoid chocking of pumps. Non-easily pumpable wastes (ex. High viscous, having high solids content etc.) may require pressurized nitrogen purging for charging the liquid to the combustion chambers. Incase of emptying liquid waste containing drums by inserting suction pumps & induced draft (hoods and ducts), set-up above such drum emptying area for collection of volatile organic compounds (VOCs) must be ensured. These collected diffused emissions must be controlled / routed to the combustion chambers. Feeding pipeline and equipment are to be cleaned before a new type of waste is fed to the combustion system to avoid undesired reactions. Incineration plants shall be designed, equipped, built and operated in such a way that the gas resulting from the process is raised, after the last injection of combustion air, in a controlled and homogenous fashion. Incineration plant shall be equipped with at least one auxiliary burner. This burner must be switched on automatically with the temperature of the combustion gases after the last injection of combustion air falls below specified temperature. It shall also be used during plant start-up and shut-down operations in order to ensure that the minimum specified temperature is maintained at all times during these operations and as long as unburnt waste is in the combustion chamber. During the start-up and shut-down or when the temperature of the combustion gas falls below specified minimum temperature, the auxiliary burner shall not be fed with fuels, which can cause higher emissions than those resulting from burning of gas oil /liquefied gas / natural gas. The burners may be pressure-atomized type with approved certification from the Bureau of Indian Standards or equivalent. In case of low calorific value liquid fuels are proposed to be injected into kiln, then double fuel injection burners may carry auxiliary fuel or equivalent liquid waste in one injection tube and low calorific value waste feed in other. Kiln and secondary combustion chamber of the incinerator may be made of mild steel conforming to IS: 2062 and of suitable thickness lined with high-grade refractory and insulation, so as not to buckle in or bulge out. Combustion chambers (Kiln & secondary combustion chamber) shall be supplied with excessive air to ensure complete burning of wastes. The blower shall have the capability to provide appropriate supply of combustion air. An inventory of fuel oil for 5days continuous operation of the incineration facility may be kept in reserve. Incinerator facility shall have a window fitted with safety view glass to view the kiln (axially) and flame in secondary combustion chambers. As the common incineration systems will be handling wastes having varying heat value, and while ensuring TOC and LOI requirements in the ash/slag, there are possibilities for sudden rise of temperatures in the kiln. Therefore, the facilities may like to have thermal refractory bricks and insulation capable of withstanding a minimum temperature of 1,300oC (typically, corundum / chromium bricks). Needful safety arrangement must be provided in case of high-pressure development in the furnace. Interlocking arrangements for CO and temperature controls (in primary and secondary chamber) with feeding devices shall also be provided. All the burners are to be equipped with flame control system (if no flame is detected, fuel injection has to be stopped, automatically - use of fast-stop-valve). Whenever the pressure in the combustion chambers becomes positive, immediately the feeding of waste shall be stopped and needful measures be taken to restore negative pressure. Exit doors shall be provided at suitable place, one each on the primary kiln and the secondary chamber of the incinerator for ease in inspection and maintenance. Appropriate slope (in general, 3 degrees), rotation rates (around 10/hr) and solid waste residence time (1-10 hrs) may be adjusted for the kilns, in order to achieve total organic carbon (TOC) and loss on ignition (LOI) requirements in the ash/slag. In the rotary kiln, the temperature shall be maintained at 800+oC in order to ensure complete burning of solid waste. Controlled flow of air shall be maintained for complete volatilization of solid waste. Minimum temperature requirement in the secondary combustion chamber is 1100oC. This may be ensured by averaging the temperature measurement of three detectors (not exactly positioned in the burner flame) at the same time with in the combustion chamber. The design and operating conditions shall demonstrate a minimum of 2 seconds residence time in the secondary combustion chambers, under critical feed conditions, so as to bring complete combustion of volatile matter evolved from the primary combustion chamber. Incase, the consistent compliance with standards based on continuous monitoring results over a period of two weeks, under critical feed conditions, is successfully demonstrated, then State Pollution Control Board / Pollution Control Committee, can recommend the proposal made by the incineration facility for relaxation in temperature and residence time, but in any case not less than 950oC and 1.5 seconds, for the consideration and approval of the Central Board. Pollution control devices are required to comply with prescribed standards for particulate matter, HCl, SO2, CO, Total Organic Carbon, HF, NOX (NO and NO2 expressed as NO2 ), Hydrocarbons, Dioxins/Furans, Cd + Th (and its compounds), Hg (and its compounds), Sb + As + Pb + Cr + Co + Cu + Mn + Ni + V (and their compounds). Besides above, the State Board / Pollution Control Committee can prescribe additional parameters, as deem fit, in consultation with the Central Pollution Control Board. Incineration facility shall explore, to the extent possible, for heat recovery. Dioxins: Keeping De-novo synthesis in the backdrop, steps must be taken to prevent reformation of dioxins by rapidly lowering the flue gas temperatures, particularly from 500osup> C to less than 200osup> C by adopting rapid quench / catalyst / adsorption by activated carbon etc. Particulate matter: Fine particulates in the flue gases requires specific dust separation technologies such as bag filters, electro static precipitator etc. in order to meet flue gas standard. In case of electro static precipitators, special care is required to avoid electric sparks due to the dust to avoid reformation of dioxins and adsorption to the fine dust. HCl & HF : In order to control halogen emissions to the desired level, in particular chlorides and fluorides, conventionally water/alkali scrubbers are in use. Mist : Often there is a need to eliminate the mist in the stack emissions, therefore, where necessary de-mister may be provided. Stack height shall not be less than 30 meters, in any case. By using simple Gaussian plume model to maintain ambient air quality requirements for all concerned parameters, in the receiving environment. The required stack height shall be the maximum of the above three considerations. Sampling platform shall be provided as per CPCB norms to collect stack samples from the chimney for monitoring the air pollutants, as and when required. Holes need to be provided on chimney as per standard CPCB norms, following diametric calculations. Access shall be provided, online, to see the continuous monitoring data by the local regulatory Board/ Committee and annual environmental report giving complete details of operation & compliance with regulatory requirements need to be published and made available to the public. Dibenzo-p-dioxins and dibenzofurans: Analysis of dioxins and furans as well as reference measurement methods to calibrate automated measurement systems shall be carried out as given by CEN-standards. If CEN-standards are not available, ISO standards, National or International Standards, which will ensure the provision of data of an equivalent scientific quality, shall apply. Water locking arrangement shall be provided for removal of ash/slag from the combustion chambers. Where appropriate, options may be explored for recycling of ash/slag either with in the facility or outside. Depending on the soluble fraction of the slag, as approved by concerned authority, slag can be used for utilization of metals, as road construction material etc. Appropriate treatment to the wastewaters from the cleaning of exhaust gases be provided. The treated wastewater shall conform to the disposal specific effluent standards. If forced evaporation is considered as a treatment option for quench/ scrubber liquor, the organic emissions, if any, shall be collected and returned to incinerator. Re-feeding of these liquors into the system may enhance the concentration levels therefore, adequate sink capacity shall be ensured. The Chief executive Officer of the facility is responsible for all the activities at the incineration facility. He can establish an appropriate organizational structure and suitably allocate the responsibilities. This organizational structure shall be made available on-site to regulatory officials. A typical organizational structure for reference is shown in Figure-I. Abnormal operations and emergency situations should immediately be brought into the notice of the local regulatory Board / Committee. While handling odourous wastes, care shall be taken (sealed containers, vapour balancing, nitrogen blanketing etc.) to avoid smell nuisance. Medical camps/ health check-ups of all the workmen of the incineration facility shall be conducted quarterly by registered medical practitioners. Adequately qualified and trained staff shall be deputed for the operations, being sensitive in nature. No adhoc appointments be made or no un-skilled personnel shall be engaged for operation of the incinerators. All the personnel involved in handling of hazardous waste and incineration shall be on pay roll. The incinerator shall incorporate all safety measures so as to provide complete protection to the operator and the unit against all possible operational/machinery failures. Dedicated back-up power facility shall be provided withs arrangement to automatically start functioning immediately, incase of power failures. The whole equipment, not necessarily kiln, may be painted with two coats of heat resistant (aluminium) paint.